Note: Because Warcross is the game inside the book in addition to the book's title, for the purposes of this review, I'll be putting the title of the book in italics and using WC to stand for the game. This book is just so much fun, you guys! 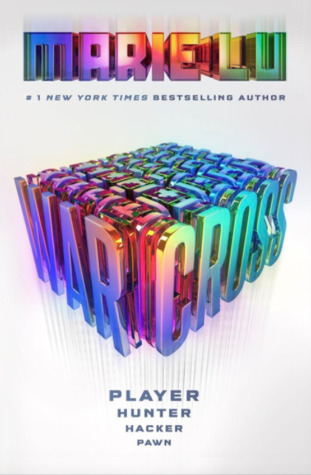 Warcross has been compared to Ready Player One a lot, and that comparison definitely stands, but it's a slightly updated version for Millenials and Gen Z. Instead of D&D, Voltron, Rush, and Pac-Man, Warcross has references to Hamilton, Harry Potter, and Zelda. I was also reminded of Inception and Super Smash Bros and Halo's multiplayer as each game of WC features five players on a team, and one of them is the Architect, whose job it is to manipulate the world during the game (and all of them basically beat one another up to win). But the similarities to other works doesn't bog down Warcross. It's highly original and action packed (with a sprinkling of romance and mystery)! By the end, readers are going to be begging for book 2. One of the things I love best about Marie Lu's writing is how well she builds her worlds, and Warcross is no exception to this rule. Not only are the descriptions vibrant and sensory, but the expansion of the world throughout the book occurs very naturally without info-dumping. Each city or character or game is introduced and then the details are filled in over the course of a scene or several scenes, but only in one case was I begging for more details (TELL ME ABOUT ASHER'S FAMILY, MARIE) and that's because of Reasons. And it's super descriptive. The whole book made me want to touch, hear, and eat EVERYTHING (yes, eat. Surprising number of scenes with food, and it made me so hungry. I'm basically dying for breakfast tacos right now). And I TOOOOTALLY want to play WC. That would be my jam. Also, Warcross explores the vivid atmosphere of Shibuya, the brightly lit downtown area that many people envision for Tokyo, as well as the more quiet, peaceful area where Hideo's family live, which are worlds apart from the grungy New York seen in the beginning as well as the super grungy and terrifying Dark World (envision the seedy underbelly of Gotham in Christopher Nolan's Batman trilogy, and that's how I imagined the Dark World). What's really exciting about Warcross that IS slightly different than Marie's previous novels is that it's jet-setting and international from the start (the WC championships are basically like a VR Olympics), and therefore, it does an amazing job of displaying a widely diverse cast. Not only are characters representative of many nations and races, one character displays a visual disability, another character is former Paralympian, and there are two gay characters (two male characters had a relationship previous to the events of the novel. Their exact identity is not stated on page). 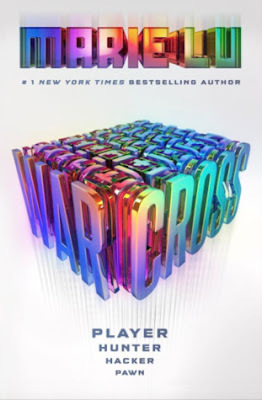 For a novel set in the future, Warcross really impressed me with how well it seemed to mirror the world as it is now. On page 73, Marie hit me in the feels with this beautiful, heartbreaking quote: "sometimes, people kick you to the ground at recess because they think the shape of your eyes is funny. They lunge at you because they see a vulnerable body. Or a different skin color. Or a difficult name." Emi continues talking about how she fought back against a classmate's bullies and has no regrets, and this was something that really touched me. There are a lot of stories, both in books and in film, that explores how dangerous progressive technology can be. Warcross definitely does this, but Warcross also showcases how people can choose to do good things with technology and their skills. Emika uses her hacking abilities to avenge a bullied classmate, and throughout the novel, her primary aim is to protect people. I think it's a really interesting juxtaposition, and I think Marie executed it really well, especially because there's a personal battle between the two characters who represent each side in this debate. The big reveal, while I saw it coming roughly halfway through the book, has me excited to see how the battle over the NeuroLink will be resolved in the second book. I fell in love with Marie Lu's writing the first time I ever picked up Legend, and I'm thrilled that each new story builds my excitement further. Warcross is a dynamic sci-fi adventure set in a vibrant world populated by charismatic, intriguing characters. With a dash of mystery, a sprinkling of romance, and a pinch or two of pop culture references, Marie has created a compelling new story that has this reader eager to dig into a second helping in book two. PS Warcross takes place 80 years before Legend, and I CALLED IT. I had two theories about how Warcross and Legend are related, and while I wanted Theory #1 to be the right theory, I knew Theory #2 made more sense. AND I WAS RIGHT. BAM. I would recommend Warcross just because it's new, and you'll want to jump on this one now. Plus, I love that the easter eggs are more updated. Ready Player One is super fun, but your enjoyment of it is wholly dependent on how well you know the 80s. I'm the minority that wasn't head over heels in love with this one, but I want to know more about everyone - especially Emika and Asher! Noooooo! I'm such a sucker for Marie's sci-fi work, but I can understand it not being someone's cup of tea. I definitely want to know more about Asher and his family. I will surely add Warcross on my TBR!